Copyright © 2019 Lucid Recess Studio. All rights reserved. Lucid Recess Studio is a Digital Audio Recording Studio in Guwahati, established in April 2008. It is owned and operated by brothers Siddhath Barooa and Amitabh Barooa who started it as a bedroom studio in 2006 before turning it into a full fledged recording studio. Over the years they have had the pleasure of working with over 200 artists from around the country and delivering indusrty standard prduction for all their clients. 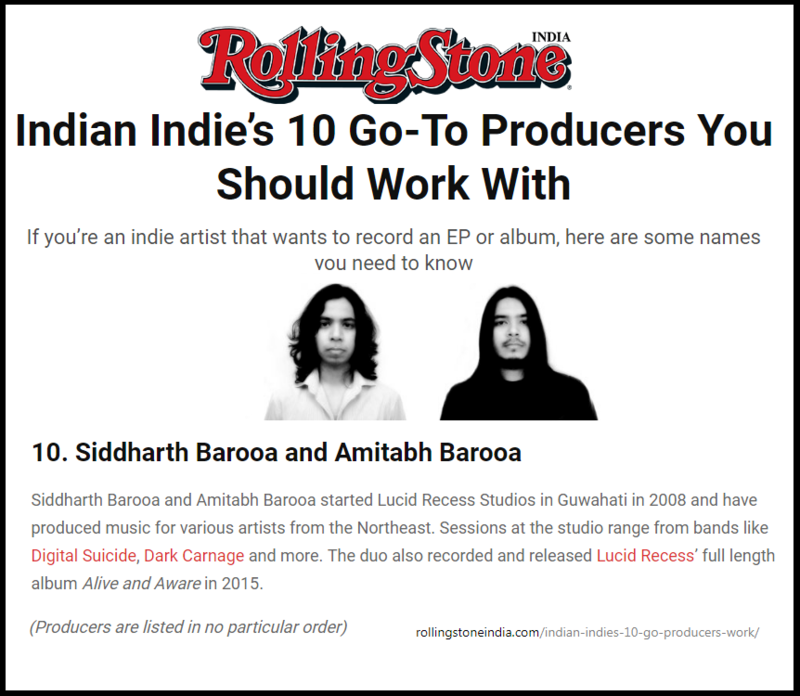 They were also named by Rolling Stone India Magazine as one of the top 10 indiependent producers of india in 2017. At a time when bands/artists get selected for major festivals, competitions, compilations, playlists etc on the basis of their demos, a good quality EP/album has become very important for an artist wanting to get ahead and get noticed. Lucid Recess Studio aims to deliver highest quality audio recordings at affordable prices. In addition to this, they also record full live band performance for artists who want to portray their brilliant live performances to audiences sitting at home. This is usually done by capturing the audio and video in one take and preserving the beauty of the performance.